Most dogs just love, love, l-o-v-e the beach. But a recent sad story out of Florida has highlighted how their owners need to stay right on their guard when letting their pooch off the leash to enjoy some fun in the sand. And at this time of year, when many of you will be taking your dogs on vacation, and looking forward to seeing them enjoying the wide open spaces and fresh air, it’s a particularly timely warning. But as a result of a freak occurrence after the two had enjoyed an afternoon at Honeymoon Island dog beach in Dunedin, FL, high school teacher and former University of South Florida student Chris Taylor is now mourning the loss of his best canine buddy. O.G, a black Labrador Retriever, had seemed fine for a short time after he returned home with Chris. But then he started having diarrhea and vomiting. Next day, Chris cooked up a regular favorite meal of chicken and rice for him, and although O.G ate most of it, Chris noticed that he seemed a little lethargic. But next morning, his condition worsened. He wasn’t eating, and he was wandering around in a daze. Realizing he needed to do something quick, Chris rushed him to the vet, who broke the heartbreaking news – that his dog was suffering from saltwater poisoning. He became severely dehydrated, and had suffered from brain damage. 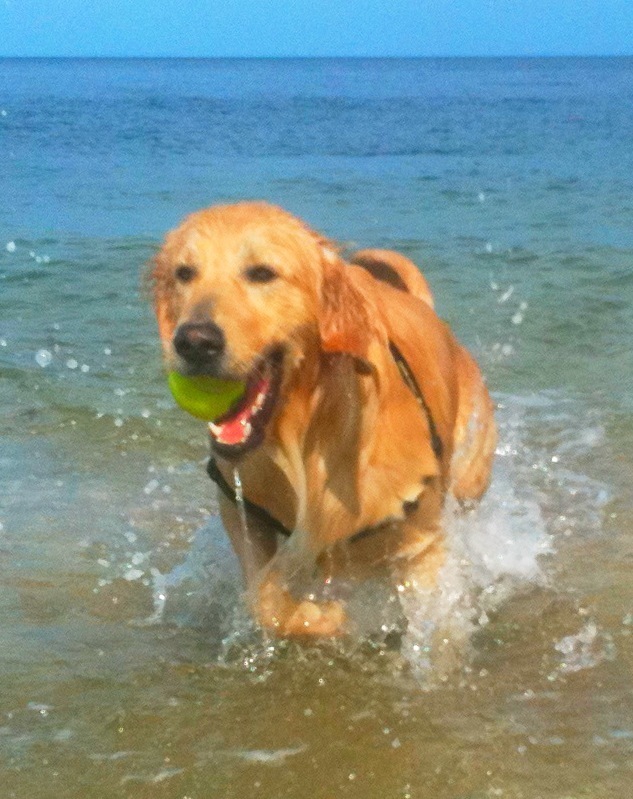 Dogs love playing in water – but you should try not to let them swallow salt water. At the time of writing, we don’t know how the story ends. But we know one thing for sure – this tragic story illustrates all too vividly the dangers salt water can pose. In extreme cases, it can lead to exactly the symptoms suffered by O.G., as well as seizures. W.F.L.A. Radio, reporting the sad case, spoke to experienced veterinarian Dr. Katy Meyer, who practises in Tampa Bay, and she said that, in nearly 30 years of practising, she has seen quite a few cases similar to O.G.’s. And often, by the time it’s realized how serious things have gotten, it’s too late to save the animal. An article from Vetinfo.com points out that, if you take your dog to the beach, you really do have to make sure they don’t drink from the sea. “Salt water has an osmotic effect, pulling liquid into your dog’s intestines. This can lead to diarrhea, which contributes to dehydration,” says the piece. “If your dog drinks too much salt water too fast, he could vomit, leading to further dehydration,” the article continues. You also need to be very careful not to throw toys into the water for him to fetch, or let him swim in the sea – either could see him ingesting enough water for there to be a real risk to his health. Then, when you add any sand swallowed with the salty water to the equation, you put your pooch at risk of suffering damage to the lining of his intestines. And that’s not all, because any algae or bacteria in the water can add to the problems and make any symptoms he starts to show even worse. How Do You Cut The Risk? First, you need to reduce your dog’s urge to drink salt water, by always having a supply of the fresh alternative available. Get into the habit of taking a travel bowl on your trips to the beach, along with a bottle of fresh water, so you can slip him a drink at regular intervals. Vetinfo’s article also recommends that you shouldn’t let your pet get carried away with the exercise while at the beach – he should take a rest at least every 15 minutes, and find a shady spot in which to sit or lie down, and lap up some fresh water without feeling rushed. The massive response this article got from dog owners who had experienced similar distress with their own dogs suggests this is a very common problem. We know from speaking with a handful of the drivers who regularly transport dogs on journeys booked through Citizenshipper.com that a plentiful supply of fresh, clean water is right at the top of their list of essentials, carried on every journey. And while very few of those will ever be going near a beach or a saltwater lake on their journeys, maybe to join their family at their summer retreats, the tale of O.G. should be borne in mind, particularly at this time of year when a beach visit could be on the agenda for many pets. 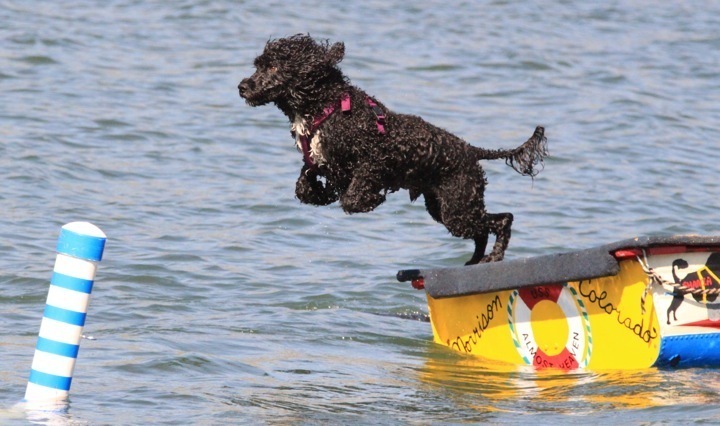 While dogs are inevitably attracted to water, there can be hidden dangers. As well as thinking about, and avoiding, the risk of your dog drinking seawater, you should also remember that not every dog is a good swimmer. Short-legged breeds such as Corgis and Pugs certainly don’t take well to water, but to avoid any dog getting into difficulties, you could get him a life vest. Lots of dogs will happily bob around in the water for a while – they don’t call it doggy paddling for nothing, right? – but if they hit problems, then a buoyancy aid is going to come into its own. Older dogs, and those who find it more difficult to get around, will particularly benefit. Your dog will probably enjoy just soaking up a little sun, but here too, they can be at risk. Sunburn can particularly affects a dog’s ears and nose, but you can buy specially formulated sunscreen to keep them protected. Always apply it 30 minutes before hitting the beach, or even just heading to the park on the hot day, as that will give it time to be absorbed properly. Playing catch is probably a dog’s number one favorite beach activity, but again make sure he doesn’t over-exert himself, and take regular breaks away from the heat of the sun. Meeting other dogs at the beach is, of course, another reason why they’re such a magnet for our canine friends. Just be sure to keep yours on the leash when other people’s pets are around, so that you can exercise some control if/when it’s needed. First and foremost, make sure any beach – or other open space where you take your pets for that matter – lets them on. Dog-friendly beaches are plentiful, but rules do vary. 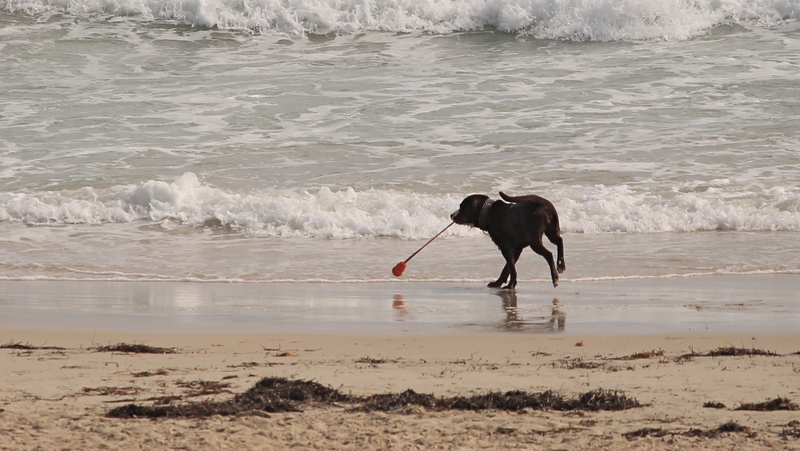 Try to keep your dog on a level area of beach with no steeply shelving areas where you can easily lose sight of them. Keep your eyes peeled for nasty hidden items in the sand. Glass, sharp shells and rocks, and of course a wide variety of garbage are all dangers to be aware of. Give them a long, clean rinse when playtime’s over. Before you head home, get rid of any leftover sand, salt and beach grime with a shower in fresh water. Have a poop scoop and bag handy. You’ll find that many dog-friendly beaches have a supply of ‘mutt mitts’ on hand, so use them! Otherwise you could be risking a fine, but also the health of your fellow beach-goers. If you’re taking your dog to the coast this summer, then happy trails. But remember to keep a close watch on them to make sure that they stay safe and healthy – and especially watch them like a hawk once they get near the water’s edge. You could so easily ruin a good vacation if, having taken all the right steps, including using CitizenShipper to take the strain away from pet transportation, to get your dog to your retreat safely and comfortably, you then let your guard down once they hear and see that oh-so-inviting water. So just keep up your guard, and be sure you all have a vacation to remember – for all the right reasons. This entry was posted in Pets and tagged dogs, Pets, salt water. Bookmark the permalink.